From left: Allison Thompson (aerospace engineering), Caitlin Myers (civil and environmental engineering), Eileen McMahon (mechanical engineering), and Hannah Breakstone (international business/supply chain management). 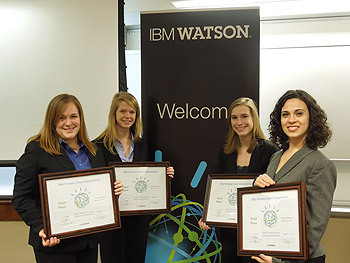 This spring, IBM challenged University of Maryland (UMD) undergraduates to develop ideas for implementing its recent customer service innovation, the Watson Engagement Advisor. The student competitors from UMD's Quality Enhancement Systems and Teams (QUEST) program answered the call at a case competition held in April. QUEST, established in 1993 with help from an IBM grant, is a multidisciplinary, reality-centered program for UMD undergraduates from the Robert H. Smith School of Business, the A. James Clark School of Engineering, and the College of Computer, Mathematical, and Natural Sciences. Intermixed teams of engineering, business and computer science majors, in just two days leading into the event, developed organization-specific strategies to acquire and implement the Engagement Advisor driven by "Watson," the supercomputer that defeated former grand champions on the TV quiz show Jeopardy. The QUEST case competition’s top three projects yielded supercomputing applications for do-it-yourself home improvement, a sports media titan, and a government regulatory body. Beyond their specific ideas, the students’ business-technology acumen and poise in presenting their work impressed industry professionals who judged the March 30 event in Van Munching Hall. “The Watson Engagement Advisor has a lot of different applications … We applied it to the home improvement industry,” said UMD computer science major Brendan Rowan, who proposed “HomeWiz” as a one-stop home improvement knowledge base for expansive do-it-yourself projects by Home Depot customers. The idea garnered first place for Rowan and teammates – Smith School students: Praneet Puppala (computer science-finance), Yash Mehta (marketing) and Jessica Manzione (accounting and finance). The students are all sophomores in the Entrepreneurship and Innovation Program (EIP), led by Director Jay Smith. The engagement advisor is IBM’s recently launched cloud-based system that activates when a consumer clicks the program's "Ask Watson" feature. That click, according to IBM, quickly helps address customer questions, offers feedback to guide purchase decisions and troubleshoots a customer's problem. An ESPN adaptation – a broad sports knowledge repository including game recaps and experts’ columns – drew second place. The presenting students were Leah Xu (computer engineering), Stephen Barbagallo (materials engineering), Eric Bailey (materials engineering) and Eric Coraggio (civil engineering). Third place went to an app to streamline Environmental Protection Agency compliance information for individuals and companies. The designers-presenters of the proposal, “Next Generation Compliance,” were Eileen McMahon (mechanical engineering), Allison Thompson (aerospace engineering), Hannah Breakstone (international business/supply chain management) and Caitlin Myers (civil and environmental engineering). “Our students were able to give some suggestions to a talented team from IBM. They also learned a lot for themselves – about how they can think about technology and apply it to markets and industries,” he said.